Why Are There So Many French Fry Shapes in the First Place? If you live in the developed world, you have an opinion on french fries. And unlike the burgers they tend to come with — all of which are more or less fine — fries are stunningly varied, subtle and specific, well worth some debate as to which styles are truly superior. But how did we get so many different fry shapes in the first place? And what does our potato preference say about us? The origin of fries is a touchy issue in Europe, where Belgium and France have long battled over who deserves credit for the savory innovation. The French say Paris street vendors came up with the “frite” toward the end of the 1700s, while Belgians argue that fishing communities of the country’s southern region struck upon the idea in the 1600s, when the river Meuse froze over: Instead of frying fish, the legend goes, they fried potato cuttings. Both stories suggest the image of a straw-shaped fast-food fry like you’d get at McDonald’s, yet a recipe brought from France to the United States by Thomas Jefferson — who is widely credited with introducing the dish to the country — recommends slicing the potatoes into “flat rounds” or “curlicues.” What Jefferson had served at the White House, then, may have been more like chips or even — yes — curly fries. Indeed, that recipe, which endured in Mary Randolph’s The Virginia House-Wife (1824), describes cutting the potato “in shavings round and round, as you would peel a lemon” — meaning the curly fry may actually predate what we think of as “regular” fries, all because it made preparation simpler than slicing narrow, regular strips of potato. Eventually, curlies would acquire breading and the best seasonings, but judging by this video of a guy cooking the 19th-century version, they were still damn tasty back then. So why do the bigger wedges exist at all? It’s simple: They’re not made for dipping in ketchup. With more surface area, a load-bearing structure and (if made correctly) a pillowy interior, they’re designed as vehicles for dripping, decadent specialties like poutine or disco fries. Whereas other fries should crunch, they’re meant to absorb. In the United Kingdom, where fish and chips took off in the 1860s, the “chip” in question is bound to be a steak fry, with the assumption that you’ll smother it in gravy, vinegar, curry sauce or any combination thereof. Perhaps we in the U.S. are nursing old Revolutionary grudges if we openly scorn this standard. When it comes to mopping up sauces, Americans prefer a homegrown potato novelty known as tater tots. In the 1950s, with frozen foods ascendant, the entrepreneurial Grigg brothers, F. Nephi and Golden, were making money as distributors of regular fries — but the machinery used to cut the potatoes left some odds and ends behind. Tired of feeding these scraps to livestock, they developed a way of mashing the bits together, then cooked and froze them to produce the bite-sized morsel that has become a mainstay of hipster gastropubs from coast to coast. An order of tots, then, can be seen as a salute to the inventive spirit, as well as a thrifty use of irregular potato pieces — though I think we can admit it brings back school cafeteria memories, too. Nostalgia plays its biggest role, though, in the crinkle fry sector. My brain tricks me into thinking I like crinkle-cut fries more than I really do because I grew up eating them at Nathan’s on the Coney Island boardwalk each summer. Crinkle fries = the beach, roller coasters, carnival games, etc. But apparently you can get hooked on them in just about any context: This month, a hot dog restaurant in Waterville, Maine, fielded an astonishing number of hostile threats after replacing their crinkle fries with straight-cut in order to save on the expensive blades that give the former their zig-zag shape. And that’s not to say the crinkle crowd is after a fancier fry, either. A few years back, Shake Shack tried to replace their frozen crinkle-cut fries, then the most popular menu item, with hand-cut fries made from fresh potatoes. It was a disaster, and the chain finally acquiesced to customers demanding they bring the old fries back. “I think we made the best fresh-cut fry ever made,” said CEO Randy Garutti. But no one wanted a change. 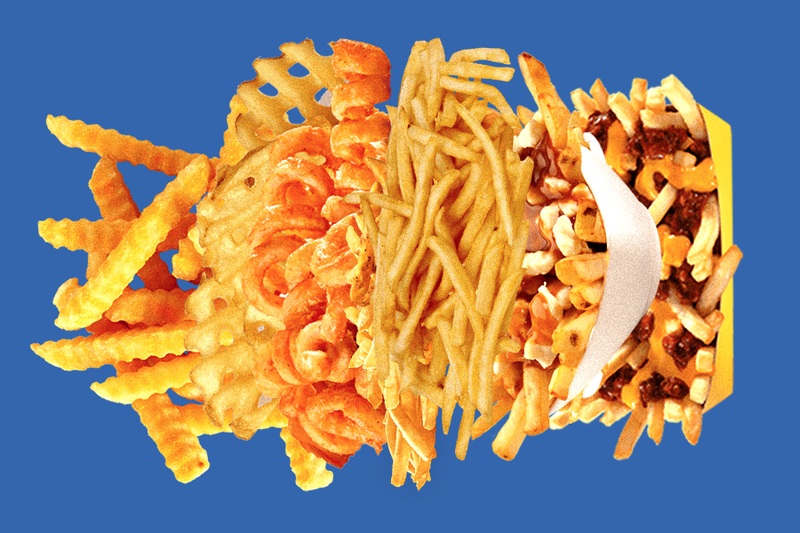 Both crinkle and waffle fries can be cut with the same slicer — a mandoline. But the latter is also known by a French name, pommes gaufrettes, and a wafer-thin version of them often complement a dish of steak tartare; the crinkle appears to have no such pedigree and feels more like an American fairground invention. Waffle favoritism, however, is also subject to regional and chain loyalties, from Chick-fil-A to Friendly’s. Allegedly, the holes in a waffle fry even allow it cook faster and more evenly. There’s reason to believer either variant provides more surface area and thus a crispier fry. Overall, they may have more in common than not, which is why they’re always crowding one another on critical power rankings, with one or the other winning out due to a singular detail — though I’d argue that waffle-cut fries take the trophy, as they frequently include the potato skin and are more likely to be dusted with additional spices. It’s an order you can feel safe in. With all these options, it’s a little baffling that Americans settled on McDonald’s straight-cut fries as the gold standard — until you realize that the brand’s explosive success was based on suburban sprawl, which meant a lot more driving. And there is possibly no better car food than hot McD’s fries straight out of the bag. I can only conclude, if these are your all-time favorite fries, that you’re a thrifty, multitasking, on-the-go, convenience-over-everything eater, and you know what? There’s nothing wrong with that. Fries ought to be dependable, graspable and unpretentious, and the fast food world’s thin, straight slivers deliver that with a lovely ratio of crunch to fluff. Anyway, there you have it: As with pasta, each unique fry shape is a beautiful necessity engineered for a purpose — even if that purpose is “to keep people from complaining because they’re already used to this kind of french fry” — and each has a story to tell. Oh, and since I’m sure someone would call me out if I fail to mention shoestring fries, I will leave you with this: They’re absolute bourgeois nonsense. Go hit up a drive-thru.